With four league matches and at least two legs of a Champions League semi-final remaining, Salah now has club great Rush’s all-time Liverpool season-record haul of 47 goals, achieved during the 1983/84 campaign, in his sights. From an advanced position on the right, Henderson helped the Reds seize a seventh-minute lead as Mane scored his 17th goal in all competitions and his eighth in his last 11th matches. Henderson curled a teasing cross into the penalty area and Mane found a pocket of space inside the Bournemouth area to glance a header at goal which goalkeeper Asmir Begovic parried. Mane reacted quicker than the visiting players and was able to steer the rebound into the unguarded net –- thus becoming the highest-scoring Senegalese in the Premier League with 44 goals. Salah had a snapshot wide and curled an effort over the crossbar in the first half, with Rush looking on from among the crowd. 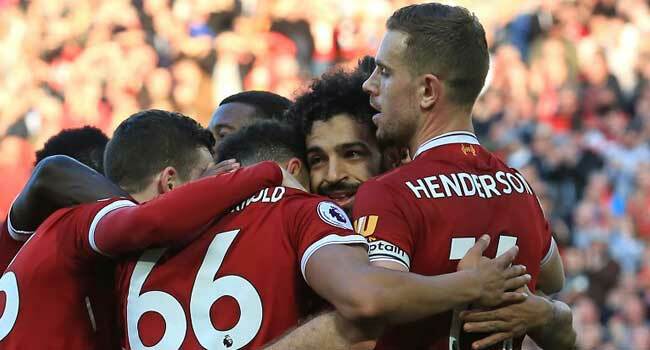 It was Salah’s 30th league goal for Liverpool as he found the net for the seventh successive home league match. Bournemouth briefly threatened when Dan Gosling’s shot brought a smart diving save out of Loris Karius but that was the best they could offer on a day when Liverpool won comfortably without breaking sweat.